As Michael Mann and Michael Mann's lawyers may have prayed, both Rand Simberg and Mark Steyn, especially Mark Steyn have proved themselves exemplary defendants, well if you want to talk about those seeking to shoot themselves in the foot head. Eli has already gone on a bit about Simberg and his ill advised 60 comment hate on Judge Greene, now the good Mother Jones, speaking through Mariah Blake, has a word on defendant Steyn. Earlier this month, Steptoe & Johnson, the law firm representing the National Review and its writer, Mark Steyn, withdrew as Steyn’s counsel. According to two sources with inside knowledge, it also plans to drop the National Review as a client. The lawyers’ withdrawal came shortly after Steyn—a prominent conservative pundit, who regularly fills in as host of Rush Limbaugh's radio show—publicly attacked the former judge in the case, Natalia Combs Greene, accusing her of "stupidity" and "staggering" incompetence. Mann’s attorney, John B. Williams, suspects this is no coincidence. "Any lawyer would be taken aback if their client said such things about the judge," he says. "That may well be why Steptoe withdrew." Steyn has added fuel to the fire filing what can only be described as a Monckton class gerrymander in the guise of a motion to Judge Weisberg's court. The original must have been covered in spite spit, referring to Judge Greene giving up the case on retirement as a "whimsical, arbitrary and selective withdrawal". Well, it goes on and on, much like The Good Viscount's threat to venture into academic publishing via the Pattern Recognition Press. This was to be expected given Steyn previous adventures with the press north of 44 40 chronicled by Big City Lib and as in those cases, according to Ms. Blake, it appears that National Review on or off line is cutting its ties with Steyn as he has not been published by them for a while. Why can't Moncktonuse his own coat of arms for a change ? @RichardTol Just looked you up. Cool, you're an economist. You should join the CCNF for Phase II, when the platform opens up to policy. @ClimateChangeNF why "if" as in "you don't know who I am?" 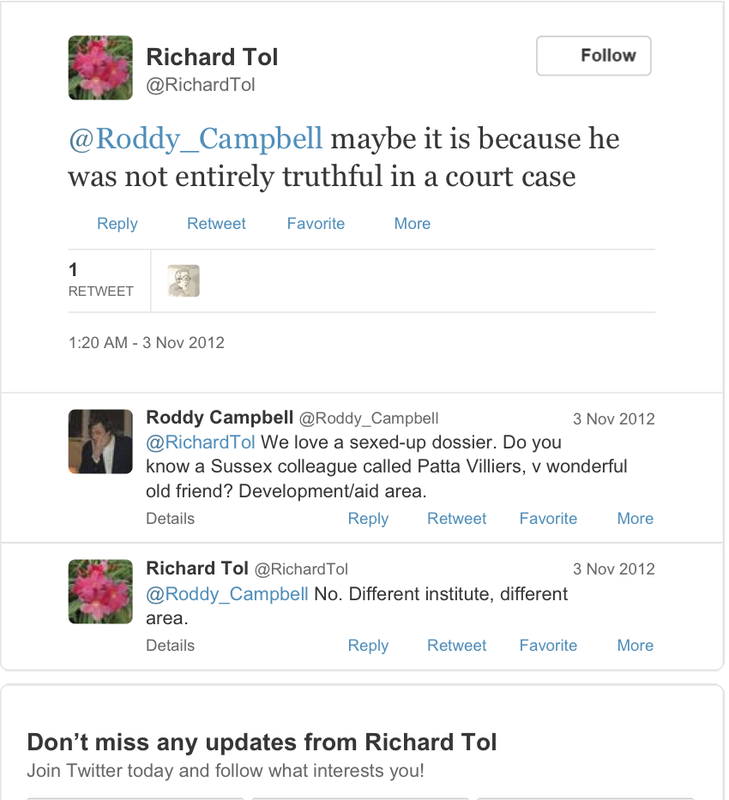 @RichardTol Because we are an objective forum and platform for scientists. @RichardTol And P.S. If you are a scientist and meet the http://climatechangenationalforum.org/columnist-criteria/ …, feel free to join the #CCNF. Lets stick to spirals - it takes a twisted Olivier like Moncton to put the fib in Fibonacci. So, Steyn's motion rests in part on what his good mates Volokh and Tol said to him (down the pub, maybe)? Did anyone else pick up this Pielke prediction?